Start Trail junction 7 on Highway 20, 18.7 miles east of the junction of highways 49 and 20 in Nevada City and 8.4 miles west of the junction of highways 80 and 20 (Yuba Gap). Trail junction 7 is 1.7 miles east of the Omega Rest Stop. Many marked trails make up the Steephollow Trail System. The Upper Loop tour allows you to return to your starting point without retracing your route (except for the first 0.6 mile) and visits many of the best trails. Along the way you will be treated to many excellent views; this includes an opportunity to take a side trip to the best vantage point in the entire area. A slightly longer route, that requires a shuttle vehicle but traverses the entire Steephollow area, is described in the Steephollow Grand Traverse tour. The only drawback to the Steephollow area is that it is located entirely between 5150 and 5800 feet elevation. This low elevation means that snow-cover can be iffy early and late in the season in anything but a good year. But snow permitting, this is a wonderful place to spend the day skiing. Locals rave about the area when they are hit by a very cold storm. Consider stopping here on your way to or from the Lake Tahoe area. From the trailhead (7) ski southeast and then east on the snow-covered road for a total of 0.3 mile until you reach a trail junction (9). 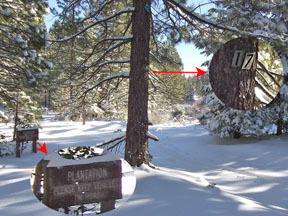 A short distance northwest of trail junction 9, on the road that leads to the Omega Rest Stop (trail junction 1 in Steephollow Trail System tour) a marker on the north side of the road denotes the location of the Nevada City Road and Washington Ridge Emigrant Trail. Ski east on the northern-most (left) trail (a snow-covered road) for 0.3 mile until you reach a trail junction (13). Ski east on the northern-most (left) trail (a snow-covered road) for 0.6 mile until you reach a trail junction (15). Trail junction 15 is not a road junction and is easily missed if you are not looking closely for the marker and trail number on a tree. Here a trail heads southwest and the Upper Loop continues to the east. 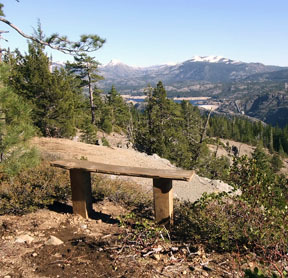 Before continuing south on the road and the Upper Loop, make a short excursion to the best vista point in the area. From mileage point 35, ski east on the marked trail (not a road) for 0.3 mile with an elevation change of +50, -50 feet until you reach the obvious overlook point (37). 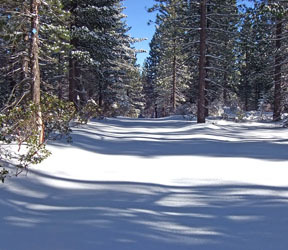 Ski south and southwest on the trail (a snow-covered road) for a total of 1.5 miles until you reach a trail junction (19). The fork to the south (left) leads to an alternate starting point. This tour continues on the fork to the west (right). Turn west (right) and ski on a road for 0.6 mile until you reach a trail junction (23) and Steephollow Creek. A short distance before you reach trail junction 23, you will pass trail junction 21, which is easy to miss. Ski west on the obvious road for 0.2 mile until you reach a trail junction (13). 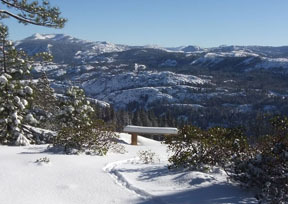 Ski west on the southern-most (left) trail (a snow-covered road) for 0.3 mile until you reach a trail junction (9). A very short distance before you reach junction 9 you will pass trail junction 11 and a road heading southeast to Steephollow Creek. 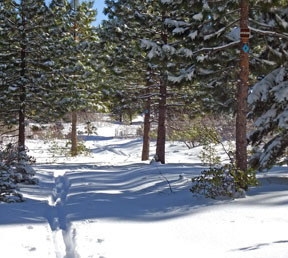 Ski west (straight) and then north on a snow-covered road for a total of 0.3 mile until you reach the trailhead (7).